The Malaysian Ringgit has collapsed in the last 6 months. This is largely due to the large amount of consumer and government debt (that I mentioned were problems for the Malaysian economy previously) with a large amount of that debt help by foreigners, the collapse of the natural resource prices (oil and gas and others) and dumping of Malaysian assets by investors losing confidence in Malaysia’s government and economy. The economy is actually surviving better than you could hope given the problems listed above. The economy continues to grow, even if the rate of growth has decreased. The most serious problems remain the high debt level and finding some way to replace natural resource income. It also puts a spotlight on corruption problems which are easier to ignore when economic growth is strong. The chart shows the recent collapse of the Ringgit versus the US $ (the chart shows the 10 year history of exchange rates). The Ringgit has collapsed not just against the USD but also other currencies (for example reaching an all time low against the Singapore $). Malaysia still has strong potential but the risks have increased greatly. The collapse of the Ringgit is an indication investors have lost confidence in Malaysia’s ability to address the long term issues with the economy. Part of the problem is natural resource income (including oil and gas and palm oil) have allowed Malaysia to not address issues and still prosper. Without very strong natural resource pricing propping up the economy the debt load and lack of confidence proved too great and the Ringett collapsed. Sadly they don’t understand the web and the video is gone. When will site with huge budgets learn the basics of web site management such as web pages must live forever. 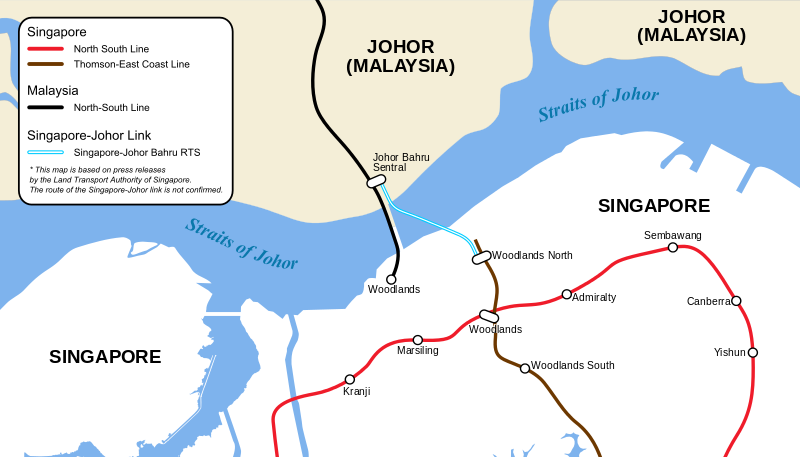 The webcast by Channel News Asia is a 22 minute look at Iskandar in Johor, Malaysia. The current population of Iskandar is 1.5 million people which is projected to grow to 3 million by 2025. Iskandar is 3 times the size of Singapore, which is the next door neighbor to Iskandar. Two of the big focuses for Iskandar are education (for which Educity has been established in Iskandar and has brought in several British Universities to setup campuses) and medical care. A recent articles shares some interesting details on the Malaysian state pension fund. For one thing they say the pension pool is the 6th largest in the world at $160 billion. I find that pretty amazing. The article also say the fund aims to increase foreign holding to 23% (from 18% currently) within 2 years. As part of that the fund is investing in industrial property in Germany and office buildings in Paris and London and is considering buildings in New York City. 70% of Singapore’s sovereign wealth fund, Temasek, is invested overseas (it stands at $170 billion, just ahead of Malaysia). The current distribution of the Malaysian portfolio is: 55% bonds, 35% equity, 5% in real estate and 5% unspecified. Mandatory deposit into the fund of nearly a quarter of Malaysians’ salaries (by the employee and employer) have build up the large investments in the fund. It is somewhat ironic that Malaysia is simultaneously encouraging others to invest in Malaysia and choosing to invest retirement assets outside Malaysia (due to high valuations and low yields in Malaysia). While it is ironic, I think it also makes sense. There is great potential for land in Malaysia so investors seeking to capitalize of potential could make wise decisions to invest in Malaysia. And it makes sense to diversify investments for Malaysia retirement funds. German industrial land is a third of the price of comparable areas in Malaysia, where speculation has driven up prices sharply. The EPF’s move to diversify its investments and secure higher payouts comes as Malaysia’s government grows concerned its citizens are not saving enough for their retirement, with 70 percent of retirees exhausting their EPF funds within 10 years of leaving the workforce. I am a bit confused (I don’t have enough details) by the conflict between 25% saving rate and using up retirement funds in 10 years. The most sensible way to reconcile these seemingly odd statement would be to guess that the fund was only “recently” established. If you save 25% of your salary for 40 years you should have a very good retirement income. If you only saved for 10 years that would be a problem. Also if you saved 5% for 30 years and 25% for 5 years before retirement that would be a problem. Najib has raised civil servant salaries and pensions, waived school fees and increased handouts for the poor under a 232.8 billion-ringgit ($74 billion) budget this year as he works to boost support for his ruling coalition. In June, the government proposed to expand the annual allocation by 13.4 billion ringgit. Growth of 5% in these economic times is very good news. One of the biggest risks to the Malaysian economy is increasing budget debt. The total debt is over 50% of GDP now, which is actually an acceptable figure (if annual deficits are small). But the annually deficient is extremely unsustainable at over 5% of GDP the last few years. A total government debt level over 75% is a serious problem. Over 100% and it often leads to extreme financial harm. Japan, so far, has been an exception with huge debt loads being sustained. Japan has had a troubled economy the last few decades but has been surviving the extremely high debt much better than most countries would. At the rate it is going Malaysia would join the extremely high government debt levels now seen in Europe and the USA in just a few years. CIMB is one of Malaysia large and highly rated banks (several Malaysian banks have yet to fall prey to the level of problems those in Europe and the USA have). Investment banking is a very tricky area. There are huge unnecessary profits to banks such as Goldman Sachs taking from the current investment banking situation (which is just a lousy system that pours billions into a few banks for activities not worth close to what they take). However the USA and European banks have often set up compensation structures that encourage bad risks, and bad pricing, and bad service to customers. If CIMB falls into that trap they almost certainly would fall to the same problems all other investment banks have fallen to – which required massive taxpayer funded bailouts. Hopefully CIMB is not going into the gambling with huge leverage aspect of “investment banking” that most of the USA and European companies have made the main factor in their operations. If CIMB just takes a simple approach to managing investment financing deals they can take huge profits and give customers huge savings off the current lousy deals they are offered by the current limited investment banking options. I would be worried though. The temptations to create huge cash incentives that will result in the company taking on huge risks and undermining customers have been impossible for most investment banks to avoid. If the investment bank is attached to a normal bank then you run into all sorts of risks of taxpayer funded bailouts.